Welcome Back! This is my third post for today. Here is my first post and second post. Today is day #3 of Taylored Expressions March release sneak peek. View day #1 and day #2 sneak peek posts if you like to see them. I have two products to showcase. Today is a special day because both are 3D products. You will love them both and a must have to have in anyone’s collections. The first product I am showcasing today is called Home Sweet Home. When I saw this die, I was so thrilled. I am building my own Home Sweet Home and putting together this die and making my project was as exciting as planning and building my own home. 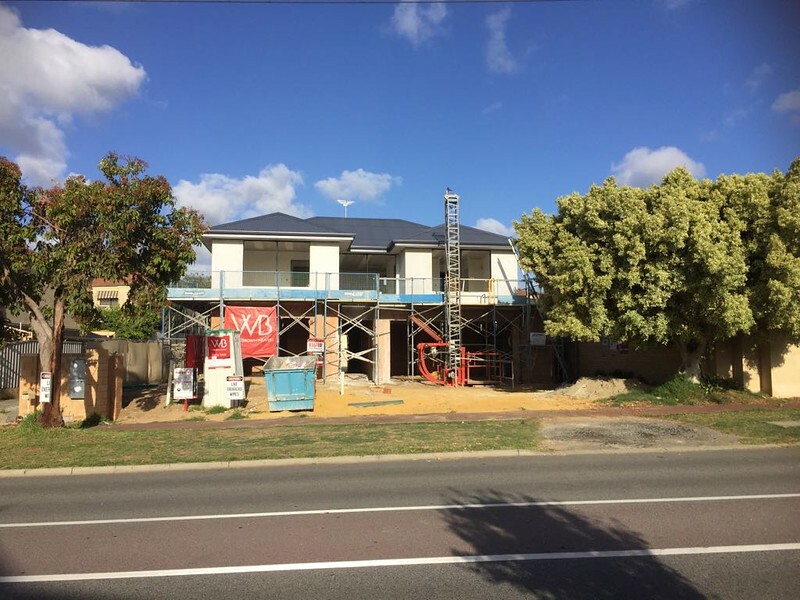 Here is a picture of my own home being built. It is about half way through. And here are couple of my projects using Home Sweet Home die. 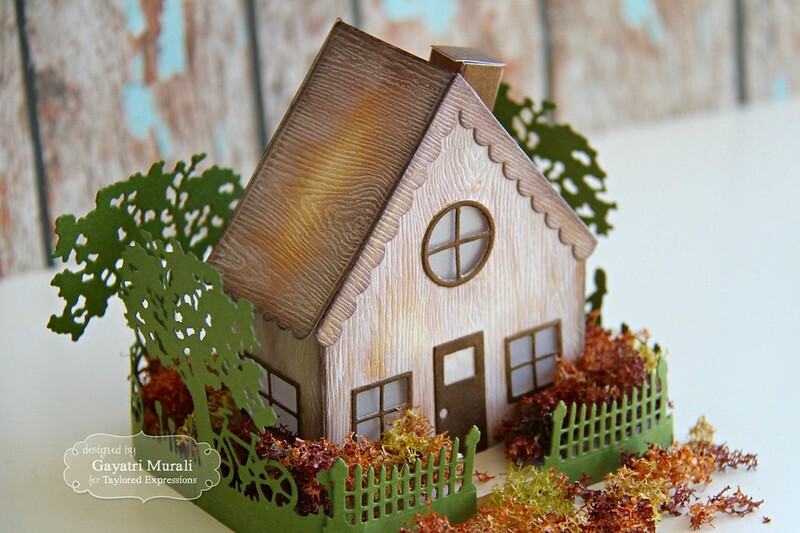 I used woodgrain cardstock to make my house. I die cut the elements then sponged Weathered Wood distress ink followed by Picket Fence distress paint and left it to dry. Then assembled the elements to make the house. 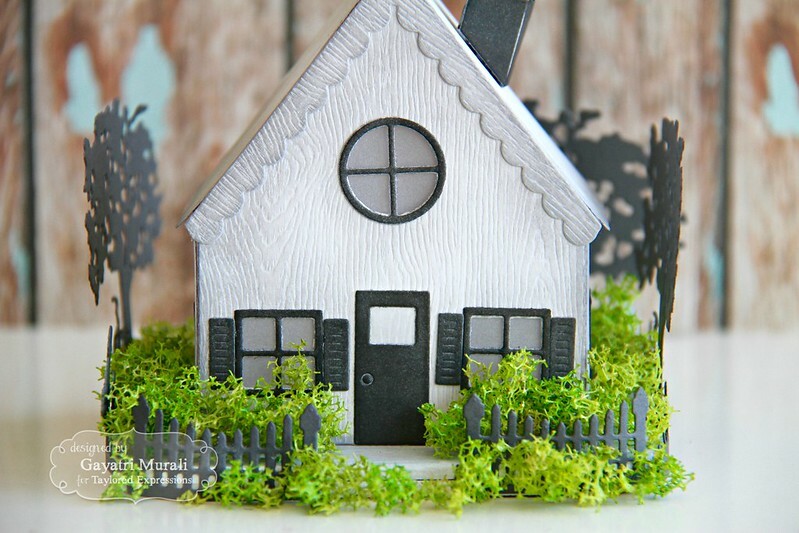 I then added the windows, doors and shutters from Home Sweet Home Accessories using Poppy Seed cardstock. I added vellum behind the windows. 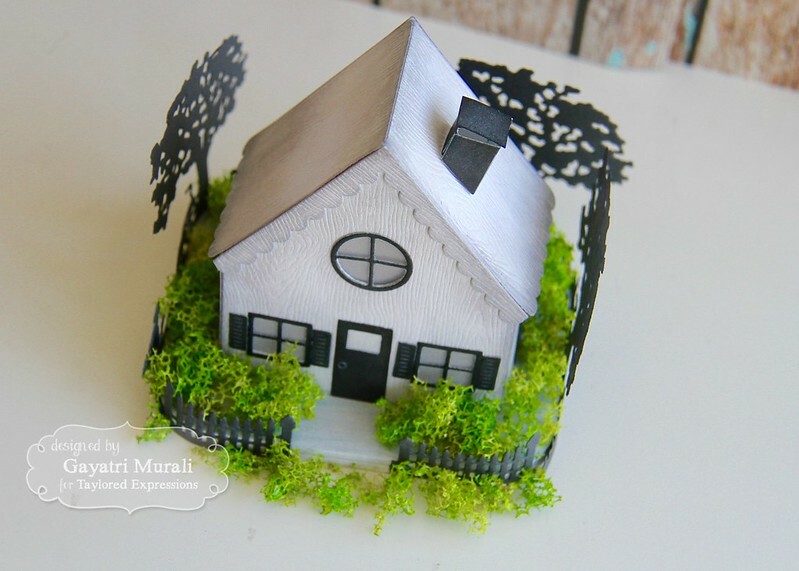 I placed the house on two rectangular coasters glued together and painted with Picket Fence distress paint. 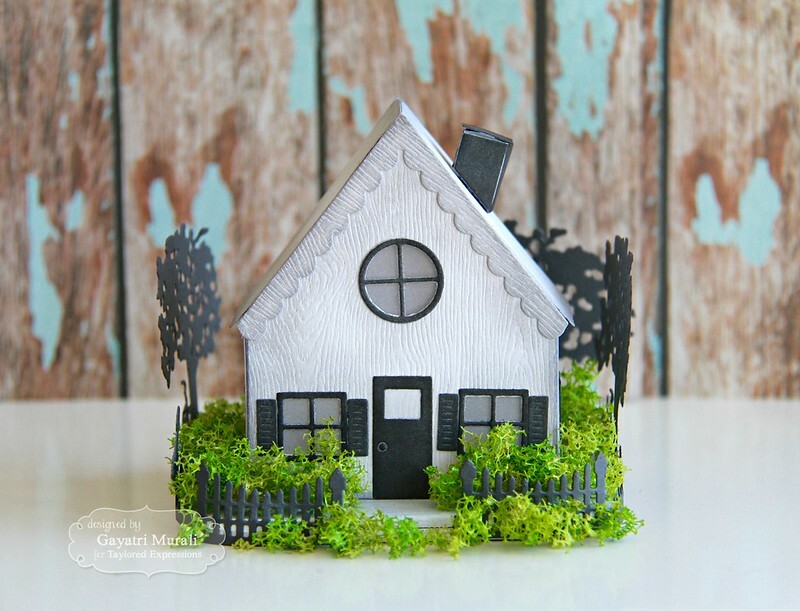 As a fence and background for the house, I used In the Garden die from Taylored Expressions die cut using Poppy Seed cardstock. Around the house, I brushed some gel medium and added artificial moss. 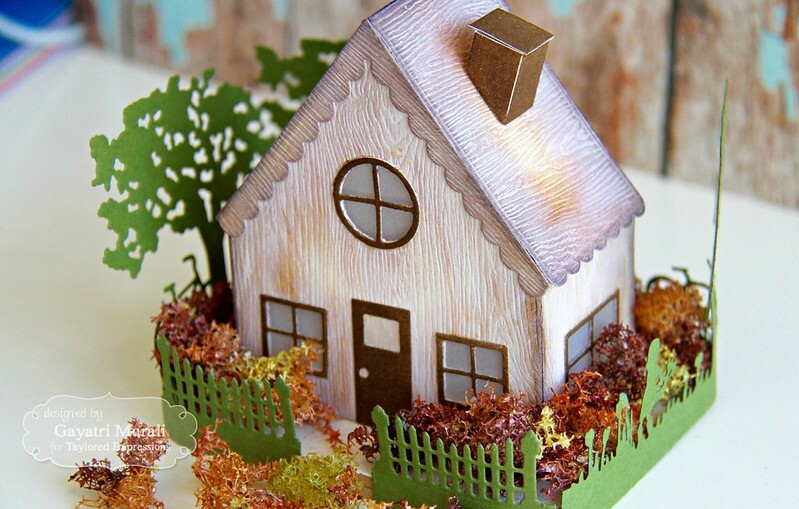 The house can be picked up to put a battery operated tea light and put back making the house glow. I did a similar process but used Gathered Twigs distress inks along with Chocolate Truffle and Peapod cardstocks from TE to make another model. The artificial moss has autumn colours. Similarly, battery operated tealight can be put inside the house. Here are some closeups of the card. Absolutely adore this die and the accessories gives the house the details. I have not showcased all the accessories. 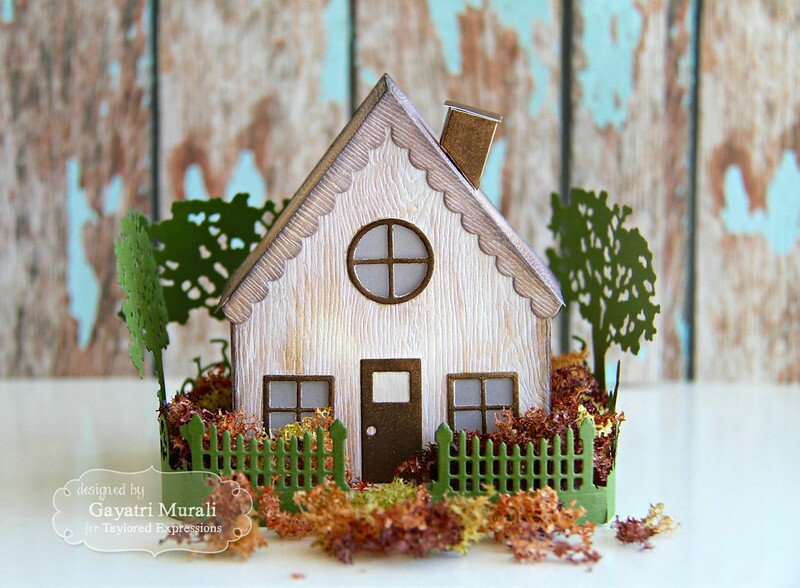 There are window boxes, flowers, grass and curtains to help jazz up the house. All the supplies using to make both the houses are listed below. The second product I am showcasing today is a die called Matchbox. Yes, this is a cute match box die. The best part of this Matchbox die is the scalloped and rectangle die which can be used to add layers on top or inside of the box or die cut to make a window. I have combined this die with Matchy Matchy stamp set to make my project. 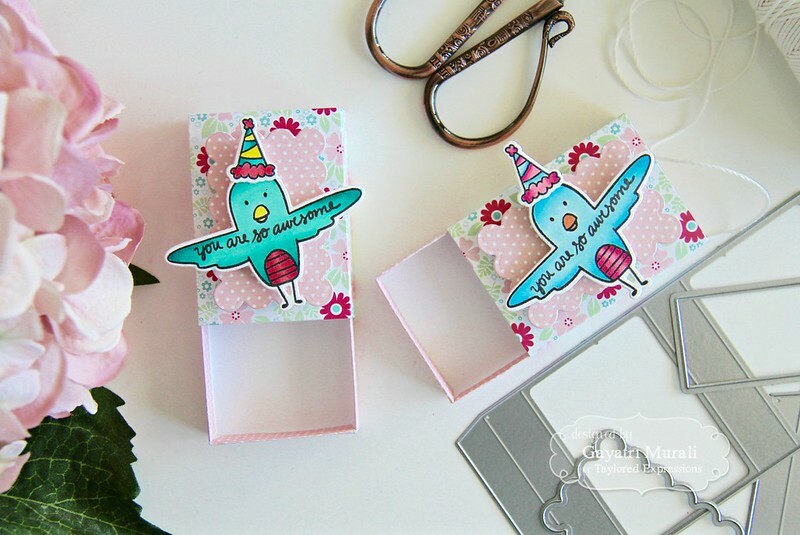 I have used pattern papers from Hello Happiness pattern paper pack to die cut the Matchbox die and make the matchboxes. Then I die cut the scalloped rectangle using another pattern paper from the same pack and layered on top of the matchbox using foam adhesive. 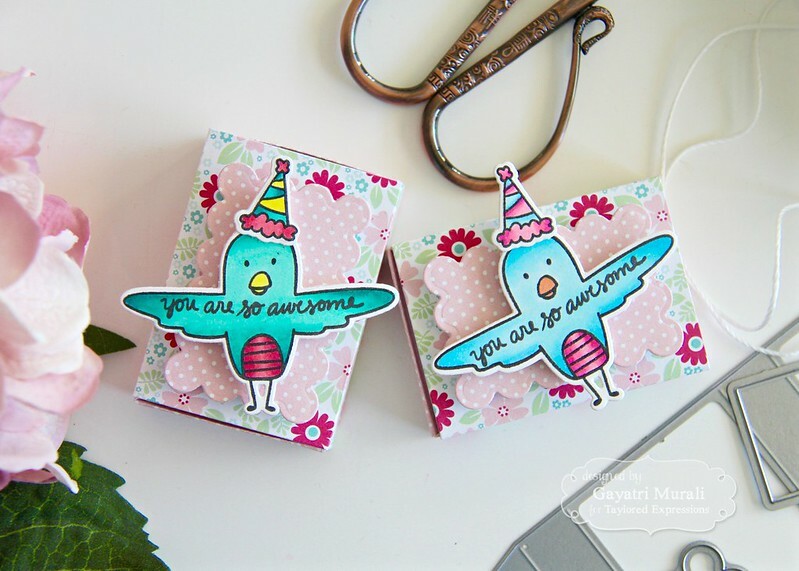 To decorate the matchbox, I stamped the bird and hat from the new Matchy Matchy stamp set, copic coloured them, die cut using the coordinating dies. I picked colours to colour the image from the pattern paper. I stamped the sentiment from the same stamp set on the wings of the bird using Oreo hybrid ink. I adhered the the bird along with the hat on top of the match box. The box is so cute that you can put jewellery inside with personal note on a piece of paper to put with it to personalise the match box to your occasional. Hope you like it. All the supplies used to make this project is listed below. Hope you are inspired by my sneak peek projects today. Taylored Expressions is celebrating Release Week with some fabulous giveaways! Visit the TE Blog to answer Taylor’s Question of the Day for a chance to win a prize from the latest release! For a limited time, earn DOUBLE CRAFTY POINTS on our Matchbox Die Set! If you’re not a Crafty Points member, it’s free and easy to join. Just create an account at the TE webstore and you’re automatically enrolled to begin earning crafty points with every purchase. You’ll earn 78 Crafty Points on the purchase of the Matchbox Die Set! Offer valid on qualifying purchases made between 9am CST on Thursday, March 9, 2017 and 11:59 pm CST on Sunday, March 12, 2017 and only while supplies last. Crafty Points are only available on purchases made via our retail site. Check out Taylored Expression Blog to check out what the question of the day is and to comment for a chance to win. While you are there check out more sneak peek projects from Taylor and rest of the designers using the March new release. I will see you tomorrow with release day of sneak peek projects. Your home is going to be really beautiful! What an exciting time in your life!